The long wait for a new playpark at Peterhead’s Lido beach is nearly over. Aberdeenshire Council officials revealed last week that much of the equipment has been bought and will be installed by the end of June. Landscape services officer Brian Shand gave the assurance during a presentation to the Buchan Area Committee detailing the range of essential routine and non-routine maintenance and capital works for the financial year ahead. The Lido has been without a playpark for several years after previous equipment was repeatedly vandalised. It is understood that the playpark will be sited nearer to the caravan park as opposed to the existing site adjacent to the Scottish Maritime Academy. 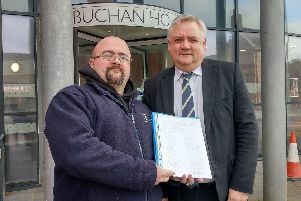 Mr Shand added that the council would be striving to ensure that both the Lido and Cruden Bay beach retained their Keep Scotland Beautiful Beach Awards for 2019. The landscaping team is also undertaking a pilot scheme in Buchan and Formartine to encourage community groups to re-use the bedding plants grown for them at the council’s Aden Country Park nursery. Mr Shand said there was a keenness to move away from using annuals and instead using plants which could be carefully stored and used year after year. He told councillors the reaction had largely been positive, with groups recognising the need to consider a different option in the future.